Hello out there to all my fellow readers and authors. No matter what our genre of preference, I’m sure none of us will ever forget when we first fell in love with the written word. For me, it was The Hobbit. I still have the first, and only, copy I bought many, many decades ago. The opening line grabbed me and never let go. That’s all it took. I have been a fan of reading ever since. The love of reading eventually turned me to a new passion, one of writing. I have written hundreds of thousands of words for short stories, poems, and songs. All unpublished and most unread by anyone other than myself. Mainly because I was afraid to let anyone read them for fear of ridicule. Who hasn’t felt the gut wrenching fear of unanswerable internal questions? Is it good enough? Will anyone besides my mother like it? Or even want to read it? I finally won out over my fears. After spending two long years writing and rewriting, and editing, I published my first completed novel, Written in Blood, in July of 2016. 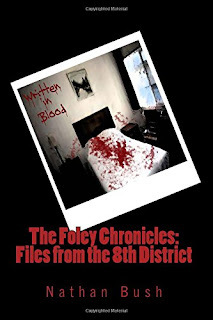 It is the first book in my Christian-based crime series, The Foley Chronicles: Files from the 8th District. While it has not won critical acclaim, it has garnered multiple 4 and 5 star reviews on both Amazon and Goodreads. I am now ready to choke out those nagging questions and mixed emotions once again. The second book in my series, Root of Evil, will be available by June 15th, on both Amazon and CreateSpace. Thanks for having me on your blog. You are most awesome!